Are you a developer who needs to handle DMCA takedown requests? It’s not trivial but it’s doable. Most of what you need to know is programmer-friendly. The law is basically a flowchart. So I created this flowchart for developers to use. It’s big – you’ll need to click through, open it, and expand to see the details. Warnings: I am not a lawyer, I am a technologist. This is not legal advice. This is my personal attempt, as a technologist, to collate available information and share what I have learned. I have taken care with this, but I am just some dude on the Internet. I’m very happy to make corrections if you see an issue – I already found and fixed one major error. I’m happy to help explain bits of this or otherwise help out. Chris mentioned this Article on chris.cothrun.com. 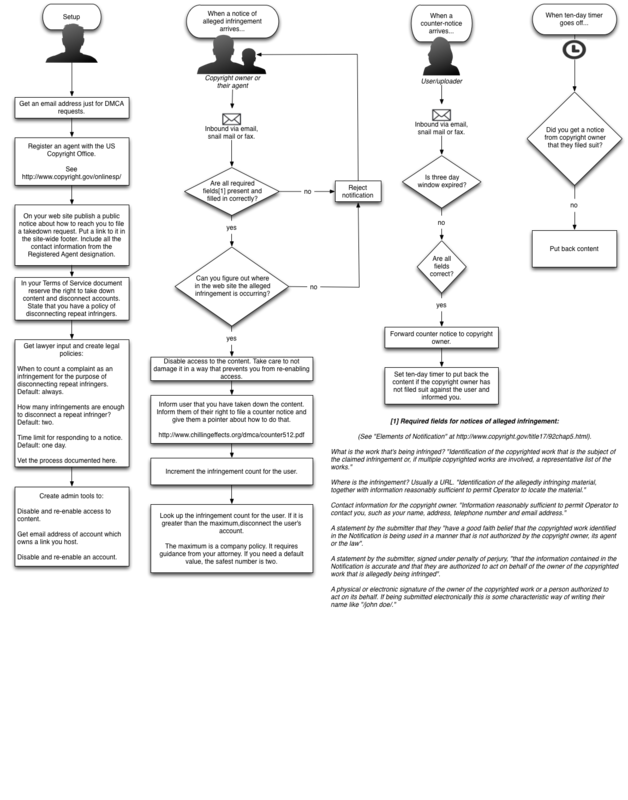 The flow chart is a great alternative to the “wall of text” for those of us who aren’t lawyers. Thanks. A question: If the counter-notice ten-day timeout expires without filing by the copyright holder, should not the infringement counter be rolled back? Otherwise, DCMA take-down notices could be used as a permanent Denial of Service(s) attack. Of course, even with an infringement counter decrement, it could serve as a DoS. But my (limited) understanding of the law may make that unavoidable. Glad it’s helpful. It took a fair amount of trouble to figure all this out and I hoped my learning time could be reused for other people. About decrementing the infringement counter after the ten-day timeout, that’s an issue that’s too subtle for a summary like this. It would be the point where you call your lawyer. The reason this is subtle is that getting lots of takedown requests for a user might count as “red flag” knowledge, which obligates you to act with or without a takedown request. This could be true even if there are counter-notices and the ten day window expires. Decrementing the infringement count after the ten-day window expires is a business choice. You want to strike a balance between protecting yourself from lawsuits and creating a good environment for your users. made with a mature understanding of the legal risk and manual examination of the account. Very nice! Is there a legal reason why the content must be taken offline before receiving a response from the uploader? Good question. The site must take down content in a timely way. One day is the rule of thumb for “timely.” However the uploader has three days to file a counter-notice. I would suggest one more action item at the bottom of the flow when a counter-notice arrives. I would suggest, in the interest of fairness, that you decrement the infringement count of the user. Without this, two or three unfounded notices of alleged infringement result in a potentially non-infringing user getting their account banned and being very pissed off. This happens more often than you might think at many popular content-hosting sites. lucasgonze mentioned this Article on some.gonze.com.